The question of child soldiers continues to vex strained relations between the Government of Sri Lanka (GOSL) and the Liberation Tigers. That the matter has been raised against the Tigers by the UN and other rights organizations is considered by Colombo as a feather in its foreign policy cap. "The Government of Sri Lanka is more interested in cynically exploiting the child soldiers issue for its black propaganda war against us than in finding a political solution to the conflict", said Mr. S. P . Thamilchelvan in an interview with the TamilNet this week. He said there were serious errors in the UNICEF report on child recruitment by the LTTE. 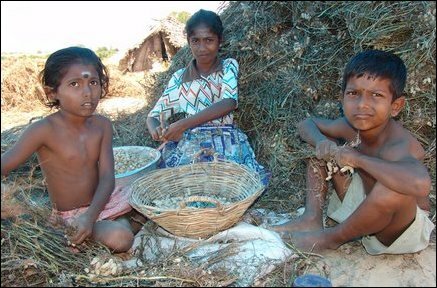 TamilNet: You have said in the letter you sent to UN Secretary General that there are errors in the UNICEF report on recruitment of children by the LTTE. What are they? Thamilchelvan: We were shocked and disappointed when the UNICEF put out the report. However, we appointed a special committee under the (LTTE) Peace Secretariat to investigate and verify the information in the UNICEF report. The committee went to the east and investigated the list of under age persons who, according to the UNICEF report, were with us. It found that persons whom we had handed back to their parents after we found them to be underage, persons who had left the LTTE and had got married and others who had gone back to their families were in the UNICEF list as persons who were still with the LTTE. We have pointed this out to the UN Secretary General with sufficient proof. The committee is continuing to verify the UNICEF list despite the practical difficulties on the ground. TamilNet: The UN has listed the LTTE as an organization that has child soldiers. The UNICEF has charged that the LTTE continues to recruit minors to its armed forces. You have said little about this in the media. What is your response? Thamilchelvan: We have been fighting and laying down our lives for the sake of a better future for our people and our children. We have shed our blood in the struggle to win their legitimate rights. Therefore, we have a greater and deeper interest in the welfare and future of our children than anyone else. Our national leader launched many projects for children’s welfare and education during war and peace. We are implementing them with the UN, Tamil Rehabilitation Organization (TRO) and several child welfare groups. In addition to this, we are implementing a project with the UNICEF for the welfare of underage persons who come to join us. But this project is not satisfactory. There are some shortcomings and practical problems in its implementation. But we are determined to create a pragmatic and effective arrangement by discussing the matter with the UN and other concerned parties. We have sent a detailed letter to the UN Secretary General explaining our commitment and determination (to address the issue). There is one important thing that you have to take note of in this regard. The majority of complaints about recruitment of minors come from areas controlled by the Sri Lankan armed forces. There are many instances of children going missing in these areas. Sri Lankan armed forces falsely accuse us of forcibly recruiting those children who are reported missing. They compel the children’s parents to say that we took them (the children) away. In issuing reports (on recruitment of minors), the UNICEF misunderstands this reality in areas controlled by Sri Lankan armed forces. TamilNet: Speaking at the UN Security Council’s special session on child soldiers on 23 February, Sri Lanka’s ambassador to the UN, Mr. Bernard Gunatilleka charged that the LTTE abducted Tsunami affected children for its armed forces. What do you say? Thamilchelvan: It has to be said that this is blatant chicanery of the Sinhala government. No one denies the fact that the deplorable conditions in which our children find themselves today were brought about by genocidal policies perpetrated on Tamils by successive Sinhala governments for more than fifty years and by the war it waged on our people for the last thirty years. Sinhala governments destroyed the lives of our people and our children by imposing economic embargoes and by banning fishing and farming. They killed thousands of our children by bombing and shelling schools and homes. Thousands of children were displaced and orphaned. The Sri Lankan state makes such insidious allegations from time to time after destroying the lives and futures of our children to escape these heinous and unforgivable crimes. These allegations are baseless. The Sri Lankan government is destroying our children’s lives in every way while hoodwinking the world that it is concerned about the welfare of our children. That the Sri Lankan state is speaking for our children is nothing but blatant fraud. Let me explain. There is a cease fire agreement (CFA) between the LTTE and the Government of Sri Lanka for the last three years. The CFA contains provisions to restore normalcy in the war ravaged lives of the people in the northeast. But Sri Lankan armed forces continue to hinder this by occupying homes, temples, hospitals and schools. They have garrisoned fertile farming lands and fishing grounds on which our people depended on for their livelihoods. Colombo thinks only of military advantage, not the predicament of our people. Our people cannot go back to their villages, cultivate their lands or fish in the sea. They have been driven to destitution, deprived of their livelihoods by military restrictions and high security zones for many long years. It directly affects our children, destroys their future. Colombo bombed schools and killed children, imprisoned them; our children have seen their parents being murdered by Sri Lankan armed forces. The Sri Lankan government wants to cover up the fact that it murdered our children, subjected them to inhuman treatment. It wants to prevent the world from knowing what is really going on in our areas. It acted in an uncivilized manner by stopping the UN Secretary General who wanted to see the Tsunami devastation in the northeast. TamilNet: You asked LTTE troops conscripted by your ex-commander Karuna to leave him and go home when he separated from your movement. But Human rights groups now say that you are forcing some of these troops to rejoin. Do you still have persons conscripted by Karuna in the LTTE in Batticaloa? Thamilchelvan: No. We positively confirm that we have no one in the LTTE today who was forcibly conscripted by Karuna. A persistent complaint that Karuna was forcibly recruiting minors was one of the reasons that prompted the LTTE leader to initiate a disciplinary process against him. We released all under age persons whom he had forcibly recruited. We wish to completely confirm this. From the beginning the LTTE has followed a very strict and selective recruitment policy with a view to building a committed fighting force. An unwilling conscript will never have the political commitment to make a good fighter for our people’s rights. TamilNet: You say that underage persons join the LTTE by giving false information of their actual age. Why does this happen and what action are you taking to stop this? Thamilchelvan: We are determined not to accept minors who come to join the LTTE. We hand back such underage persons to their parents. Yet some minors attempt to join us by claiming that they are older than their actual age. Then I must say that our children’s growth is affected by poverty and malnutrition induced by the war Sri Lanka waged on our people. It is difficult to gauge the actual age of these persons. Also I should draw your attention to the fact that many Tamil parents lost the birth certificates of their children due to constant displacement and destruction wrought by the war. Hence there is no firm basis on which we can verify the age of those who attempt to join up. It is really difficult to search for the persons on the UNICEF list of missing and dead people. TamilNet: What have you doing to protect and look after the interests of underage persons whom you hand back, what is the role of the UNICEF in this? Thamilchelvan: We take into account the economic conditions at an underage person’s home before we attempt to reunite him/her with their families. If a family’s economic condition is bad we try to find them jobs and provide them some sort of skills training. We are looking after children afflicted by the Tsunami until their families are back on their feet. We have to keep them in transit camps or children’s homes with the permission of their parents until their families are economically stable. We provide healthcare, education, school, and uniforms to these children. Tamil Rehabilitation Organization and the UN are helping us specially with this project. 04.09.04 LTTE rescues Tamil children exploited by Kuchchaveli fisherm..
18.05.04 LTTE team assesses Batticaloa development needs, meets UNICE..
31.01.04 Ten youths from UNICEF list sent to Kilinochchi Transit Cent..